Tired out from the show? 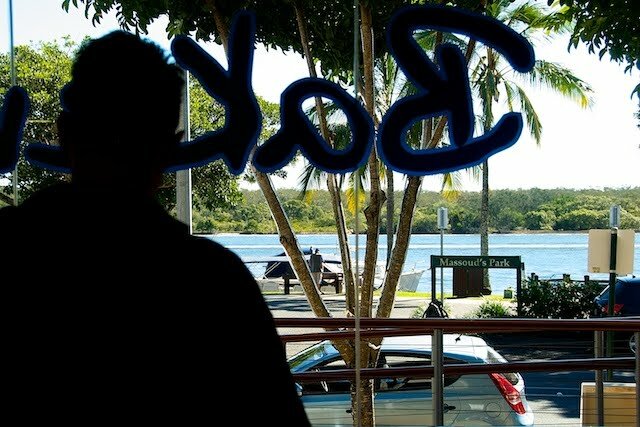 Well why not stop at the Bakery at Noosaville for a quiet coffee and a spot of watching the world go by. 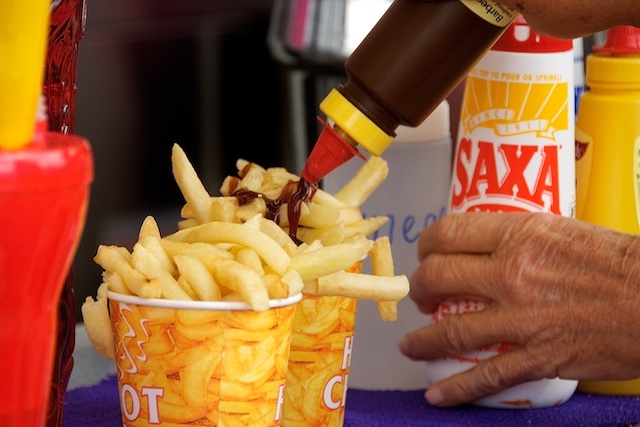 London has one, and now so has Nambour. 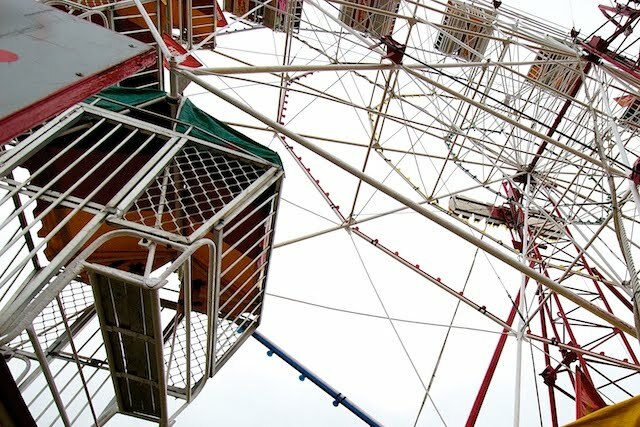 The main difference is that from the top of this ferris wheel, one can see the budgie pavillion. One can't do that in London. 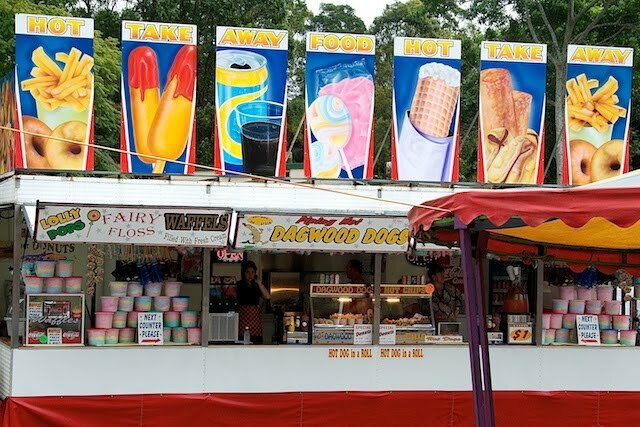 With that, let's call it quits from the Nambour Show for a few weeks eh? I've had enough! 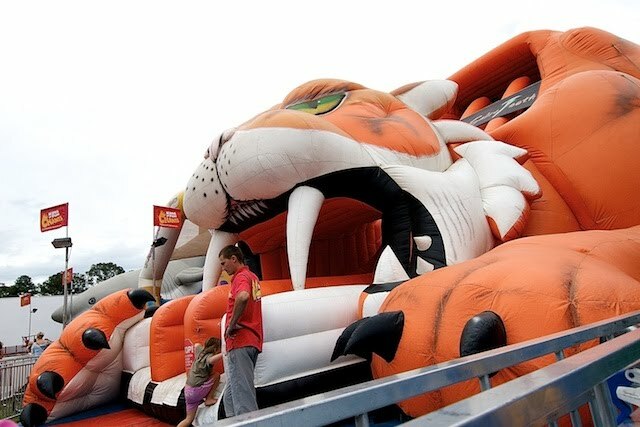 I want to be eaten by the sabre toothed tiger mummy. I really have trouble understanding this new generation. 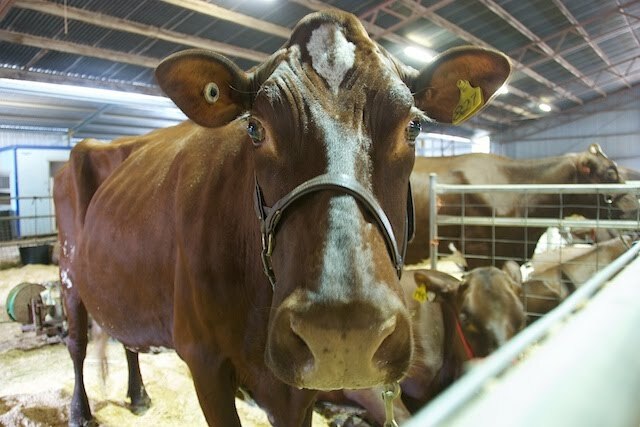 Dairy cows get an evil glint in their eye just seconds before they attempt to swallow your camera whole. 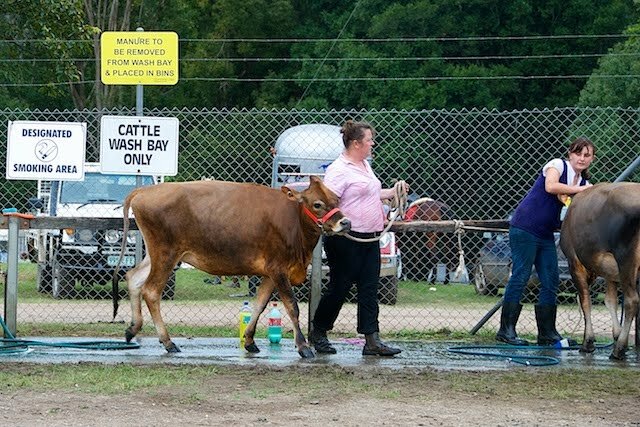 While the cattleman is tucked up safely in his bar, the lady folk are making good use of the cow wash. What evil mind would allow smoking in the middle of an area where people are spraying hoses? 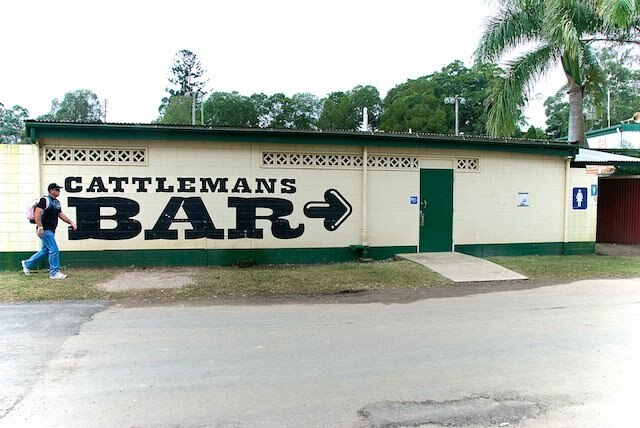 The Cattlemans Bar looks strangely like a public toilet to me, but the sign seems convinced. Sadly there are apostrophes missing all over the country these days, having been officially removed from all place names, they now seem to be fading from other situation as well. And then there's the literal translation, which infers that the bar is indeed very tiny. Perhaps large enough for a solitary cattleman. 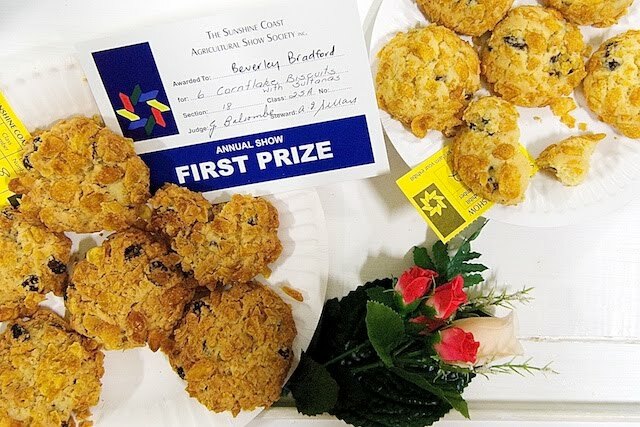 My mum used to make these, and I reckon hers would have won first prize! The "Agriculture Show" isn't just about agriculture of course, there's art and handiwork and crafts, but you'll have to believe me as far as the rest is concerned. I thought it had been too long since I'd posted a pic that looked a bit "building", it's not good enough to win a ribbon though. Perhaps I should enter something from this blog next year? 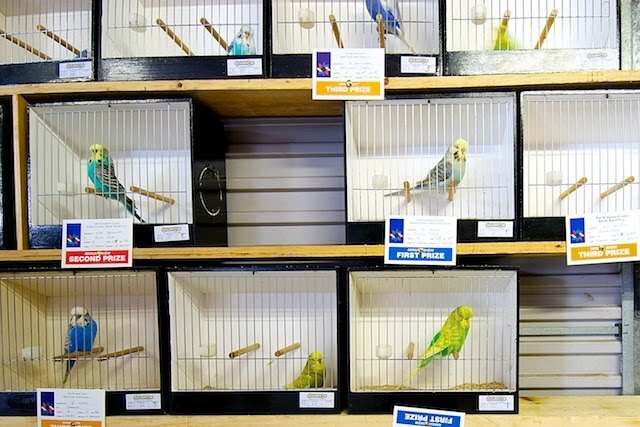 They are native to our outback skies, these little fellows, although in the wild they are green and nowhere near as fat as these monster show budgies. If they were any bigger they'll be showing them as poultry and eating their eggs! In America they're called chickens, but that's what we call little chooks! 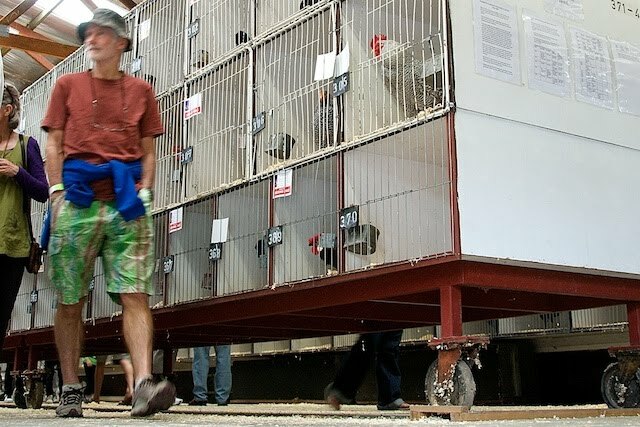 "Show hens" on show, winter 2010! 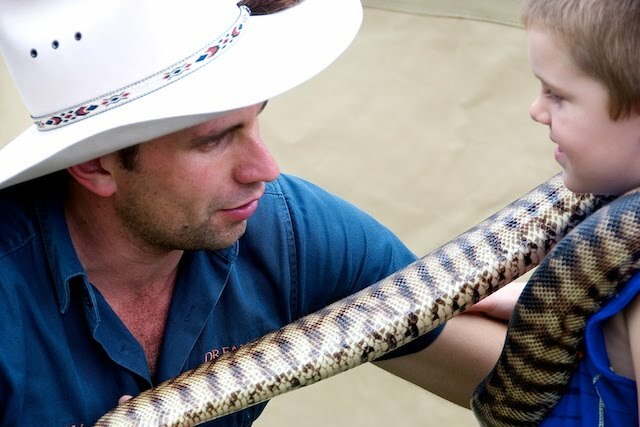 Garry the snake man had an amazing affinity with people as well, calmly talking and caressing them through the whole "nurse my snake he won't bite, he's a python" affair. Dont pythons crush their meals before swallowing them whole? There are quite a few bits of Nambour that are just really pleasant, with the topography providing a green hilly background at every turn. 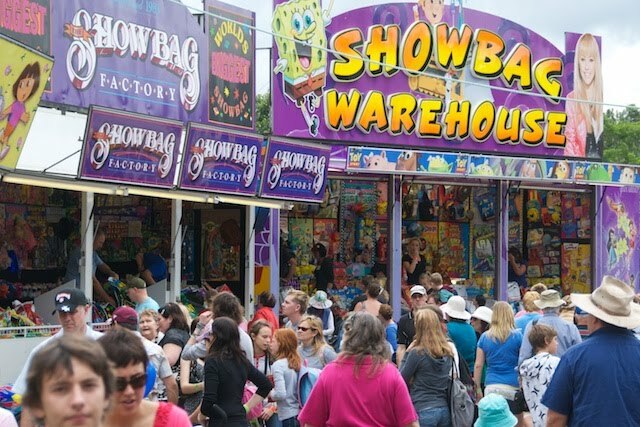 The showgrounds is one of those places. I know boys will be boys, and I know we all played cowboys and indians when we were kids. But we didn't point laser powered assault weapons at one another. 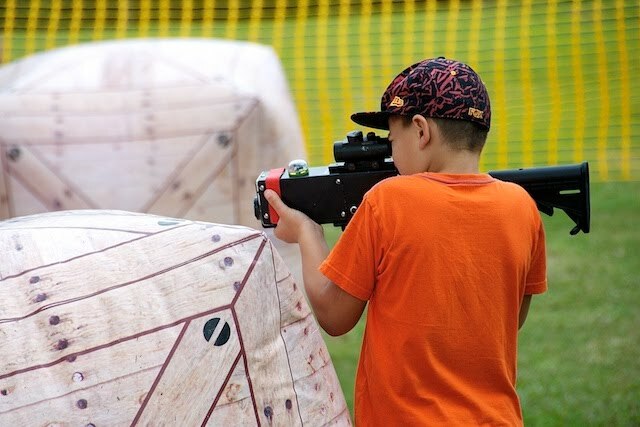 Shooting at a sideshow was a tin ducks moving along a conveyor, not at other kids who were shooting back. Somehow this is all too real for me, except for the lack of maimed and dying for those on the receiving end! 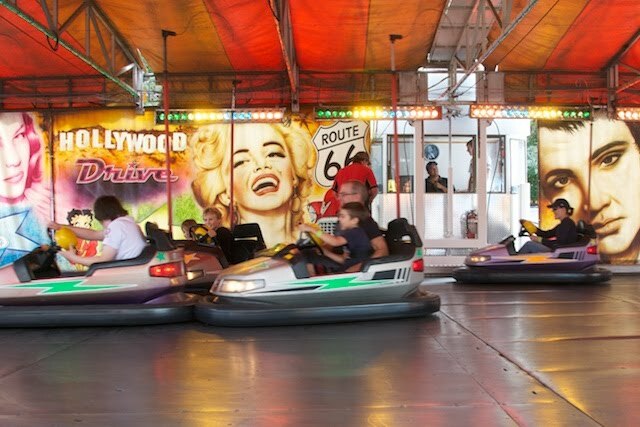 Bumper cars are known as "dodge 'ems" here, and for reasons that I can never fathom, always seem to have sideshow themes around Hollywood personalities who met untimely ends. 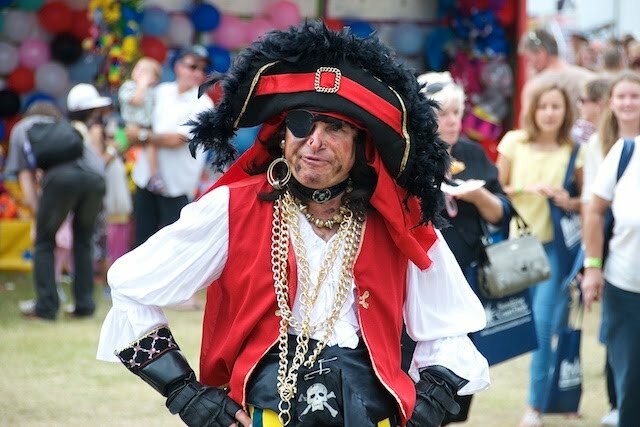 He's not a real pirate, he doesn't have a parrot. One of our councillors takes a walk among his people. 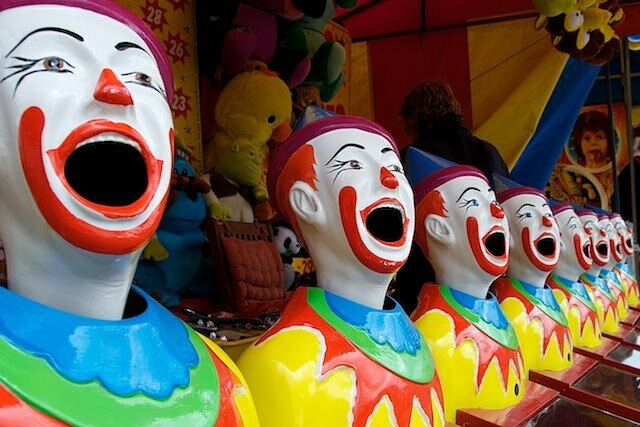 I'm not sure why they are called "Laughing Clowns" although I suspect that "Clowns Who Have Just Suffered a Rude Shock" wouldn't sit nearly as comfortably in the sideshow market. Guaranteed organic, low fat, low GI, vegetarian, gluten free. No I'm not sure if there's any sugar in it. At first glance I thought the sideshow colour schemes were loud and garish. Then I realised they matched the texture of the crowd and wondered how they did that! 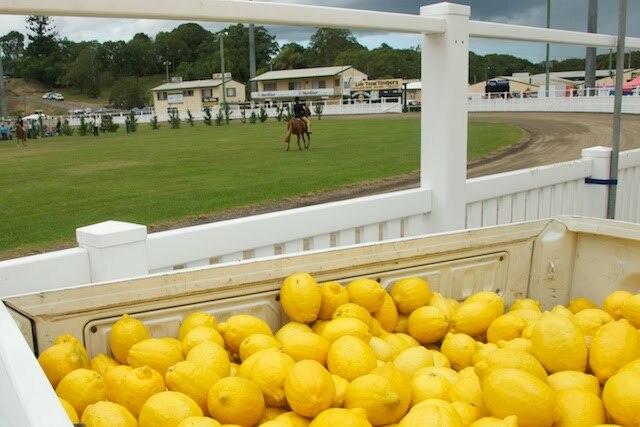 I have no idea why he brought a truckload of lemons to watch the horse events, so any suggestions will be welcome! 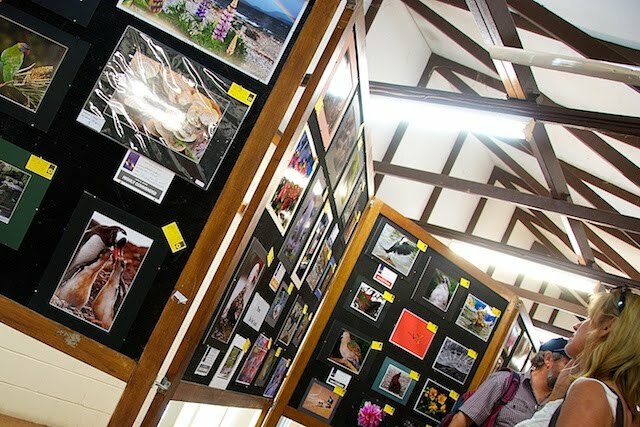 If you have just popped in expecting to see photographs of sun drenched beaches or glistening rainforest, I'd like to remind you that it is winter here, and this is a month of Nambour Show retrospective. The show is about horses, hot dogs, hats and having a good time really, and I rather like a food stall which thoughtfully provides a view of the arena for it's customers. 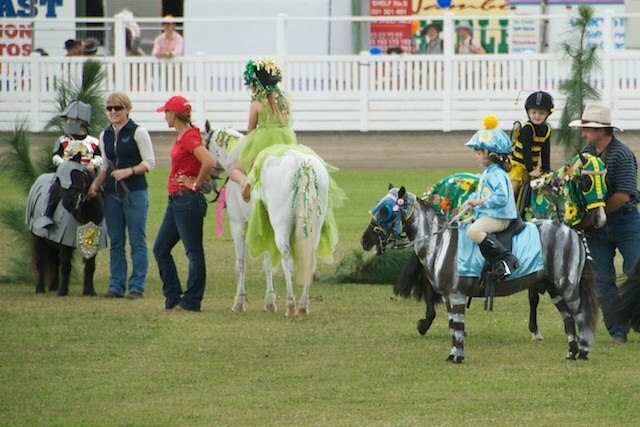 The littlies get to have a horsey fancy dress. I have no idea who won, but I suspect that the zebra is a ring-in. While the judging is happening, the next age group is warming up. I'm not much of a horsey person myself, but I quite enjoy my annual dip in the trough. Sometimes I think a different lens and a pass to let me into the arena would be a fun thing to have. 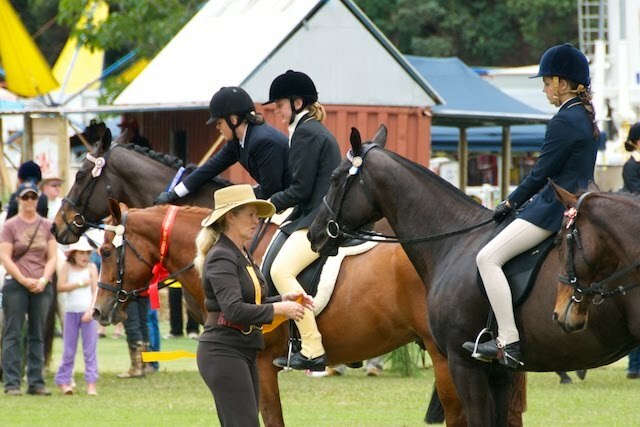 The judging is over, so all that's left is to present the ribbons. Later in the day, the grown-ups will come out to play. It's interesting to note the crowd is completely attired for the depth of our winter. 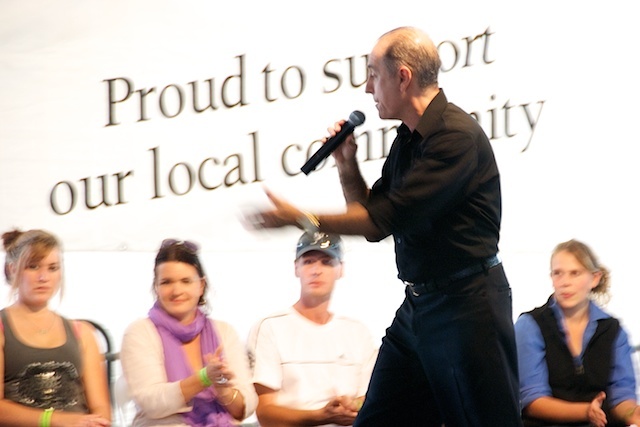 A show wouldn't be a show without a bit of public hypnotism. I've never quite understood the need that some people have to volunteer to perform on stage to a paying audience while under the spell of a complete stranger, and I find it all a bit to too difficult to watch. Of course I stopped long enough to take a photograph, which by my calculation was something like 1/40 of a second! 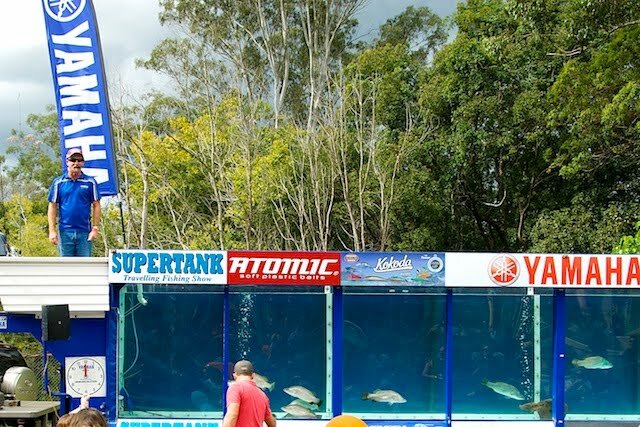 This gentleman brings a thing called a supertank to the show, and provides regular demonstrations of fishing techniques from his "tinny" mounted more or less at water level. I'm fairly sure if I had a dam that was stocked with as many barramundi per cubic metre, I wouldn't be needing any of his lessons though. When the various shires and cities were amalgamated into one two and a bit years ago, no one could agree on when to hold the show. 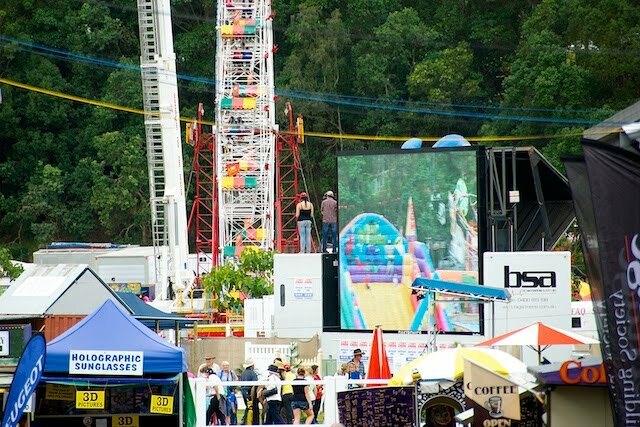 So the old Nambour and Noosa Shires and Caloundra City decided to keep having their own particular event on the day they always did. 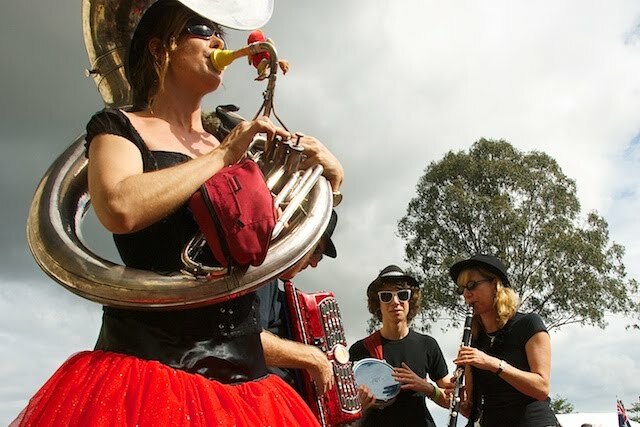 This places us in a rather confusing state, where there are actually three public holidays across the city to allow us to attend the relevant show. Except that the holidays are granted on geographic grounds, rather arbitrarily along the lines of where the former shire boundaries were located. Whichever shire one works in, one gets a day off on its Show Day. 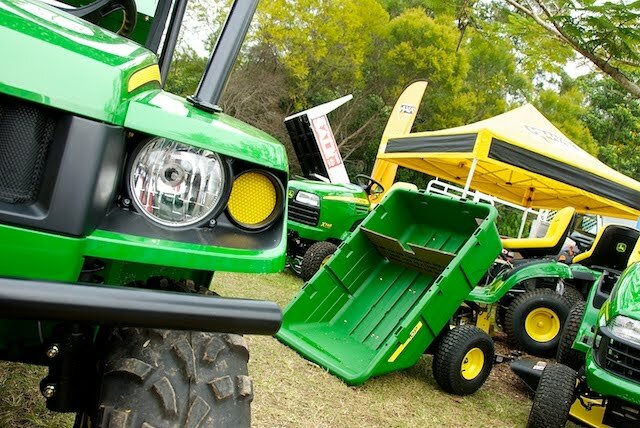 On a far more practical note, we get three times the opportunity to buy a tractor than any other city in Australia. Our Agricultural Shows are the equivalent of County Fairs I suppose, they can be summarised as an event where folk from the country bring their stuff to the city, and folk from the city pay money to look at them and their stuff. 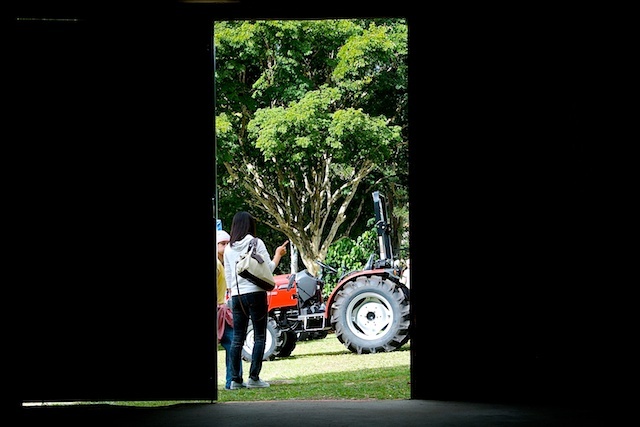 The showgrounds always have a few dark buildings called "pavillions" filled with decorated fruit and cakes and handicraft and other secrets, with openings that look out onto tractors. 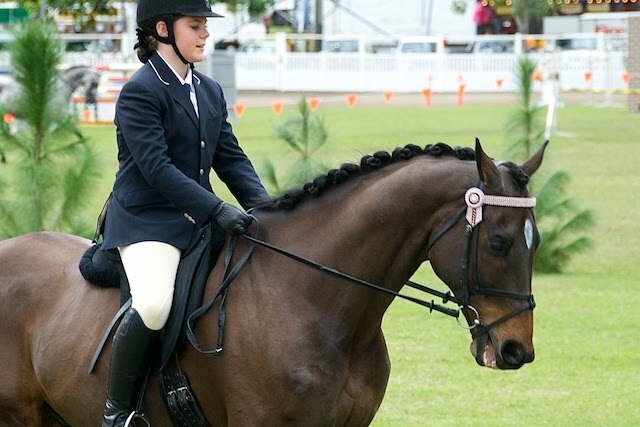 Nambour got such a bad rap last time I tried to post some photos, that I thought I'd spend a day at the show, which in turn means inflicting everyone with a month's worth of pictures! 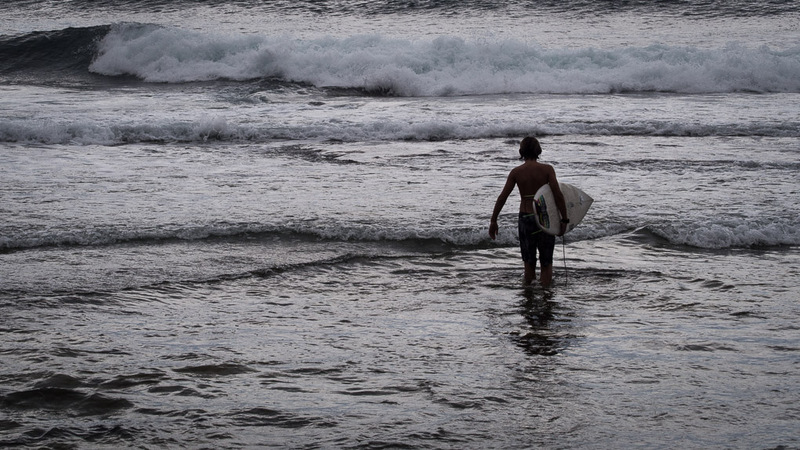 No surf, no buildings for the month of August, just an Agricultural Show retrospective! 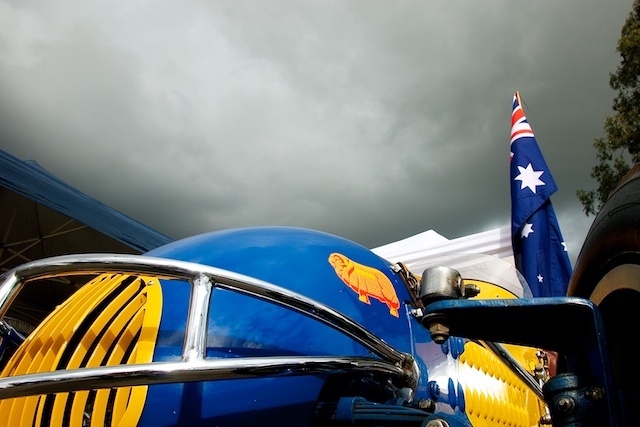 Bill Goode's midget speedway racer from several decades ago, glints under an ominous sky.